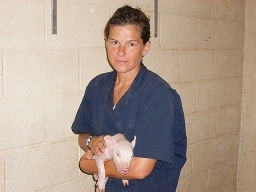 Dr. Kim Holloway, VMD, is our swine veterinarian. Dr. Holloway is pictured here checking on the swine during her monthly site visit. Dr. Wendy Freeman, VMD, is our sheep veterinarian. Dr. Freeman is pictured here doing some sheep pregnancy checks during her monthly site visit.